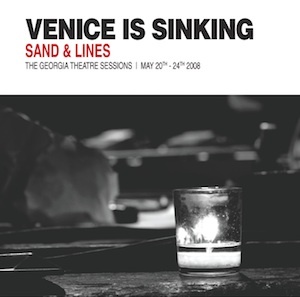 Athens, GA’s Venice Is Sinking are set to release their third full-length, Sand & Lines: The Georgia Theatre Sessions, on June 13th. Recorded live, stripped down in the vein of the Cowboy Junkies Trinity Session using two mics and minimal adornment, Sands & Lines exudes a late-night warmth that begs for the vinyl treatment. In terms of overall feel this may very well be the groups most consistent and rewarding work yet. Included in the set are two covers, one being Galaxie 500’s “Tugboat,” a track that fits the band’s (and in particular vocalist Daniel Lawson’s) aesthetic like a second skin. Coincidentally, Galaxie 500 have just reissued their catalog. Being so, I asked Venice Is Sinking’s Lucas Jensen to reflect on the choice of the cover and its place within the set at the now defunct Georgia Theatre…. “My memory of this is that Daniel brought it to the band as a dream cover, being the good Galaxie 500 fan that he is, and, given that the song is two chords, it wasn’t difficult to pick it up. However, my recollection of the song was iffy, at least in the drum part department, so I concocted this scheme of playing the drums with brushes in one hand and sleigh bells in the other. I’m pretty sure that James had never heard the original, so he was just following Karolyn who played the lead. Over time, we settled into the structure, which bears little resemblance to the original in arrangement, dynamics, or tempo. Personally, I like that it happened organically after a lot of jamming on it, rather than us saying, “Okay, let’s switch part A with part C” in an effort to change things up so it wouldn’t be a rote cover. Of course, in grand Venice is Sinking tradition, we had to include some sort of build up or crescendo. You know how we do. Venice is Sinking performed Tugboat for our show Docubloggers during SXSW 2010. It was a great live performance, and you can check it out here!